Follow in the tracks of Fangio, Brooks & Moss, and drive the famous Aintree Circuit. Bookings for the LMC Aintree trackdays in May & October open approximately three weeks before each trackday. Join our New Trackday Mailing List and we’ll send you an email as soon as the bookings go live for each Trackday. Existing subscribers – please help us to help you! Thanks to the General Data Protection Regulations we have been obliged to delete our old e-mail list and ask subscribers to add their details again. If you wish to be kept informed about our track days, please add your contact details to the new list even if you originally did so prior to April 2019. Liverpool Motor Club members will receive advance notification of the date and time that our booking system will be going live. We reserve the right to give our members priority when accepting bookings for our track days. adult admission just £5, accompanied kids under 16 get in free. Liverpool Motor Club is not a commercial organisation, but is a motor club run by volunteers. We don’t have the overheads of an office or staff, and none of our officials are paid. All proceeds from our motorsport activities are ploughed back into our events and help keep our booking/entry fees low. Our aim is to run safe, friendly events to the highest of standards for the benefit of motorsport enthusiasts. We don’t have any automated response systems, every contact you make with us will be handled individually by one of the officials that you will see at our events so please allow a little time for us to respond, especially at busy times. Liverpool Motor Club – run by enthusiasts for enthusiasts! Our track days are not restricted to members of Liverpool Motor Club and regularly sell out well before the closing date for bookings. As a result, several drivers were disappointed not to be able to take part last year. Whilst we are sorry that we could not accommodate everyone, we are sure you will agree that by keeping to our tried and tested policy of running sessions, not open pit lane, and restricting the number of cars on track to a maximum of 20 cars at any one time, we are running events that are safe and enjoyable for all our participants. Fantastic value at only £125 per car, additional driver in same group/session £33. Passengers £10 (pay on the day, must be over 16 & one at a time). All cars will be noise tested and must not exceed 105dBa at 0.5m from the exhaust at 75% max revs. A 98dBa limit on drive-by tests may also be imposed. Fully marshalled event with Licenced Race Rescue and medical personnel. ARDS instructors available FREE to providing basic coaching. Open to non-members, with discounts available to members of Liverpool Motor Club. Excellent value refreshments on site throughout the day. Sessions run continuously from 10am to at least 4.30pm with a 45min. break for lunch. Driving standards observed, and unacceptable behaviour acted upon. It is the resposibility of participants to supply whatever safety kit they feel is appropriate to keep them safe. A suitable crash helmet is compulsory – see ‘Important Information‘ below. When deciding which group to enter, please consider how quickly you are likely to be driving compared with other cars in that group. Do not over estimate your or your car’s likely performance. Pick a group that is likely to match your speed, not just your experience. If you book for a quicker group than the one you should be in, your enjoyment will be compromised as you will be concentrating on keeping out of the way of faster cars rather than enjoying your time on track . 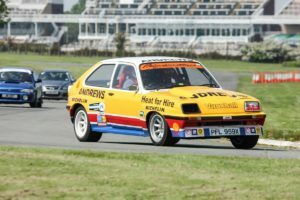 We strongly recommend that every driver reads – A Lap of Aintree – Really Helpful Advice – written by regular Aintree ARDS instructor, Andrew Whitehouse. You will learn something, no matter how competent you think you are! Please do not over estimate your ability or that of your car by booking for the “experienced” group unless you really are quick on track. You will spend much of your time watching your mirrors and keeping out of the way of others which will spoil your day, and could risk yours and other drivers’ safety. Firstly, CLICK HERE to read the Event Rules and Site Regulations and then the ‘Important Information’ section below about safety. By submitting a booking, you agree to comply with our Event Rules and Site Regulations, and acknowledge the details contained in the ‘Important Information’ section below . Then click on the BOOK TRACKDAY button at the bottom of this page. Up to 2 additional drivers to share your car can be booked at the same time on-line. All drivers must be pre-booked, we do not accept any bookings for additional drivers on the day. You will be able to book for up to three drivers per car on-line so please have the information for all drivers to hand before you start the booking process. Adding an extra driver later will require you to complete a separate booking form to post to us with payment, which is likely to delay your booking with the risk that the event may be full by the time we receive it. Please remember that the email address that you give us on the booking form will be used to send you your acknowledgement so please ensure it is correct. We regret that neither e-mail nor fax applications can be accepted and we must point out that under no circumstances will bookings be accepted on the day for either main or additional drivers. For further information, please contact our track day entries coordinator Phil Howarth on 07784 224 731 (before 9pm please) or by e-mail via the Trackday Bookings email link on our Contact Us page. You’ll have to book quickly as our customers keep coming back again & again! All driver bookings must be made in advance. Bookings (including additional drivers) will not be accepted on the day of the event. ARDS instructors on hand for advice – free! Unlike track days elsewhere, the organising team are all volunteers – no one is paid for staging the event – any surplus is ploughed back into running our events and keeping the booking fees as low as possible! All cars must be mechanically and structurally sound and All participants must wear a correctly fitting fire resistant crash helmet in good condition. We consider that only helmets complying with the following standards are considered suitable: FIA 8860-2004, FIA 8860-2010, FIA 8859-2015, SA2010, SA2015, SAH2010. Flame-resistant overalls and gloves are strongly recommended. Arms & legs must be covered (no T shirts or shorts). Cars must be adequately silenced to max 105dbA (static). Rear view mirrors are compulsory. Passengers over the age of 16 years may be carried (one at a time) but they & the parent/guardian must have completed the appropriate ‘signing-on’ forms acknowledging the risks involved. The event will be fully marshalled and safety cover will be provided. Driving standards will be closely observed and the organisers will exclude anyone considered to be driving without due regard for the safety of themselves or other participants. The organisers do not provide any safety helmets or clothing. We recommend that track day participants use safety equipment that is at least as good as the minimum standard required for competitive motorsport. Cars must have a towing point of adequate strength at both front & rear identified using a contrasting colour. A suitable point on the roll hoop will generally suffice for open single seater and open sports racing cars. Slick (untreaded) tyres are not allowed unless the vehicle is fitted with an adequate Roll Over Protection System (i.e. Roll Cage/Roll hoop). Racing will not be permitted. 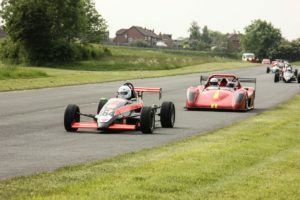 All sessions are run on the Aintree Club Circuit which forms part of the track used for five British Grand Prix in the late 1950’s and early 1960’s. Don’t miss your chance to drive this historic Circuit, where Stirling Moss secured his first ever Grand Prix win in 1955 and, in 1962, Jim Clark won the last ever British Grand Prix to be held at Aintree. The Track Days are run to the same high standard as our award winning Championship Sprints, and with the same emphasis on a safe, enjoyable day for all. Camping is available overnight (free) on the evening before the event. The gates are locked and the site fully secured at 9.30pm promt with no vehicular or pedestrian access or exit until 6.30am next morning. If you intend camping/parking a vehicle on site overnight, we strongly recommend that you aim to be at the venue by 9.00pm at the latest. but we hope you will join us on 25th May & 5th October 2019. Please note that if your booking has completed correctly, you will receive 2 automatic confirmations, one from LMC & one from PayPal. Although we acknowledge receipt of all applications straight away, formal confirmation of a successful booking may take a further 7 days to give us time to allocate drivers to the available spaces in the groups. Liverpool Motor Club is not a commercial organisation, but is a motor club run by volunteers. We are grateful for your patience.